Quality handcrafted tonic water is hard to find, so AA Badenhorst Family Wines decided to make some themselves. The result is a spring water that has less added sugar and is full of the natural botanical flavours of quinine, lime, cardamon and mint. View more from Tonics, Tonics & Mixers, Gifts for The Host, AA Badenhorst Family Wines. When they say "dry", they mean "dry"
On its own, it's a pleasant drink but it overpowers any gin you have with it. Probably better suited to a vodka & tonic. Lovely dry finish - less sweet than common or garden tonic water. Loved this - much less sweet than cheaper tonic waters, so it allows the flavour of the gin to come through. Great packaging too - and in recyclable glass, plus you'll be supporting smaller local industry...what's not to like? This tonic water is really tasty, but definitely not worth the price. It is light and minty, and makes for a great G&T. Great tonic, really uplifts any gin it is paired with. 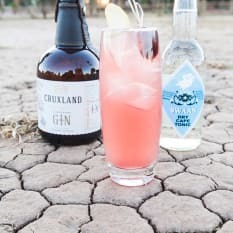 Got this together with the Cruxland Gin, but it was flat - almost no bubbles... Luckily, it still tastes great and the gin is awesome, but I would have loved it if it was more sparkling.